The Naval Research Laboratory 30-days animation (up to October 22, with forecast added up to October 30) on the right shows that sea ice has grown in extent, adding plenty of very thin sea ice, while the existing ice has hardly increased its thickness. Thick sea ice used to extend meters below the sea surface in the Arctic, where it could consume massive amounts of ocean heat through melting this ice into water. As such, thick sea ice acted as a buffer. Over the years, Arctic sea ice thickness has declined most dramatically. This means that the buffer that used to consume massive amounts of ocean heat carried by sea currents into the Arctic Ocean, has now largely gone. Since it's freshwater that is now covering a large part of the surface of the North Atlantic, it will not easily sink in the very salty water that was already there. The water in the North Atlantic was very salty due to the high evaporation, which was in turn due to high temperatures and strong winds and currents. Freshwater tends to stay on top of more salty water, even though the temperature of the freshwater is low, which makes this water more dense. The result of this stratification is less evaporation in the North Atlantic, and less transfer of ocean heat to the atmosphere, and thus lower air temperatures than would have been the case without this colder surface water. The cold lid over the North Atlantic has meanwhile expanded. Greenland has been experiencing wild weather swings this month, with temperatures shifting from one extreme end of the scale to the other end. The image below shows temperature anomalies on October 17 (left panel), October 23 (center panel) and a forecast for October 30 (right panel). Temperatures are forecast to swing back to the extreme high end of the scale, pushing up temperature anomalies for the Arctic as a whole to as high as 2.37°C on October 30, 2015. These wild weather swings over Greenland threaten to cause cracks in the ice, with methane hydrates in the ice becoming destabilized, resulting in releases of huge amounts of methane from hydrates and free gas into the atmosphere, as earlier discussed as feedback #21 on the Feedbacks page. Strong winds have further contributed to extend the cold lid over the North Atlantic, while also making cold air flow from Greenland over the North Atlantic. 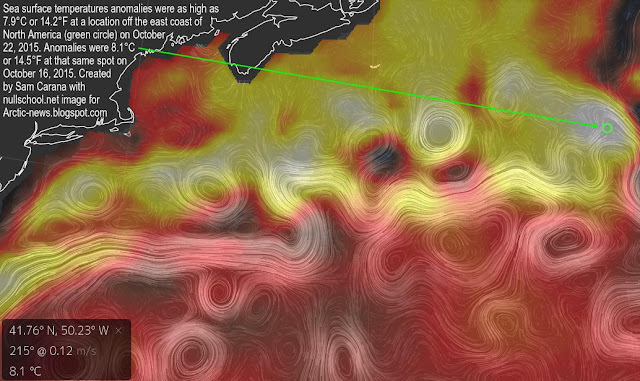 This is illustrated by the image below, depicting the situation on October 23, 2015, with the left panel showing surface wind speed, while the right panel shows the resulting sea surface temperature anomalies. The video below shows surface wind speed forecasts in the Arctic from October 25 to November 1, 2015. Of all the excess heat resulting from people's emissions, 93.4% goes into oceans. Accordingly, the temperature of oceans has risen substantially over the years and - without action - the situation only looks set to get worse. As ocean temperatures continue to rise, especially in the North Atlantic, the Gulf Stream will keep carrying ever warmer water from the North Atlantic into the Arctic Ocean. 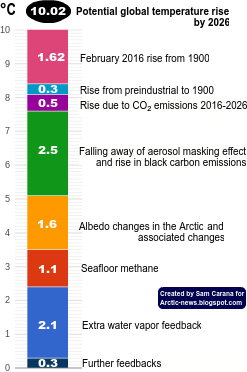 Without the buffer of thick sea ice to consume the increasing amount of ocean heat, the threat is that ocean heat will increasingly reach the seafloor and unleash huge methane eruptions from destabilizing clathrates. 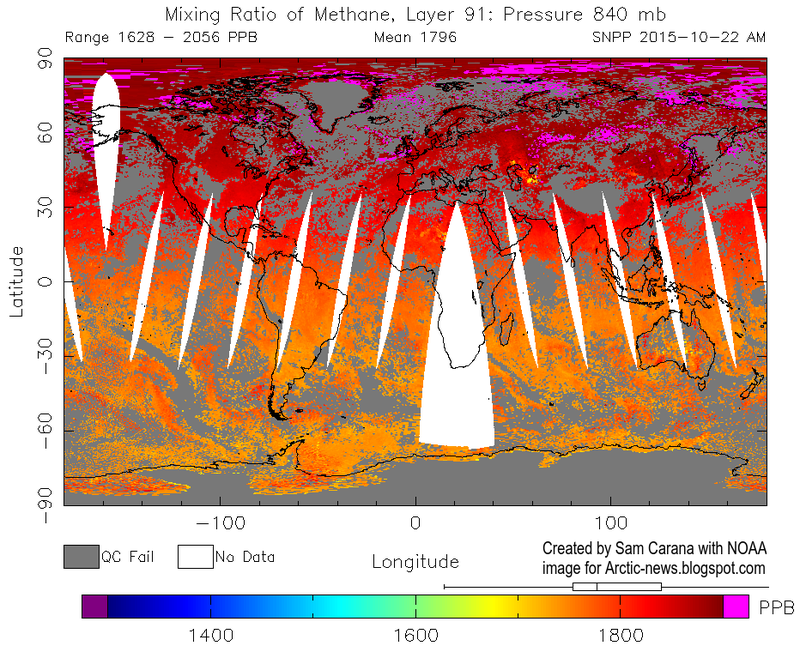 Such large methane eruptions will then warm the atmosphere at first in hotspots over the Arctic and eventually around the globe, while also causing huge temperature swings and extreme weather events, contributing to increasing depletion of fresh water and food supply, as further illustrated by the image below, from an earlier post. The North Atlantic continues to be very warm. Sea surface temperature anomalies were as high as 7.9°C or 14.2°F at a location off the east coast of North America on October 22, 2015. Anomalies were 8.1°C or 14.5°F at that same spot on October 16, 2015. Sea surface temperature anomalies were as high as 7.5°C or 13.6°F at a location near Svalbard on October 25, 2015. On October 9, 2015, sea surface temperatures were as high as 13.1°C or 55.6°F at that same location near Svalbard (marked by green circle on image below), an anomaly of 9.5°C or 17.2°F. These temperatures indicate that the water can be much warmer below the surface than at the surface, and that this warm water is transported by the Gulf Stream below the surface of the North Atlantic into the Arctic Ocean. The animation below switches between the above two dates and also shows that the cold freshwater lid on the North Atlantic has meanwhile extended further south. In the Bering Strait, warm water also keeps flowing into the Arctic Ocean. 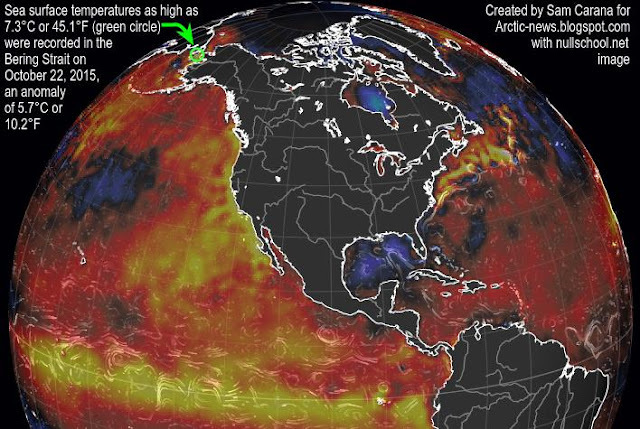 At the location marked by the green circle on the image below, sea surface temperatures were as high as 7.3°C or 45.1°F on October 22, 2015, an anomaly of 5.7°C or 10.2°F. The images below show high methane concentrations over the Arctic. 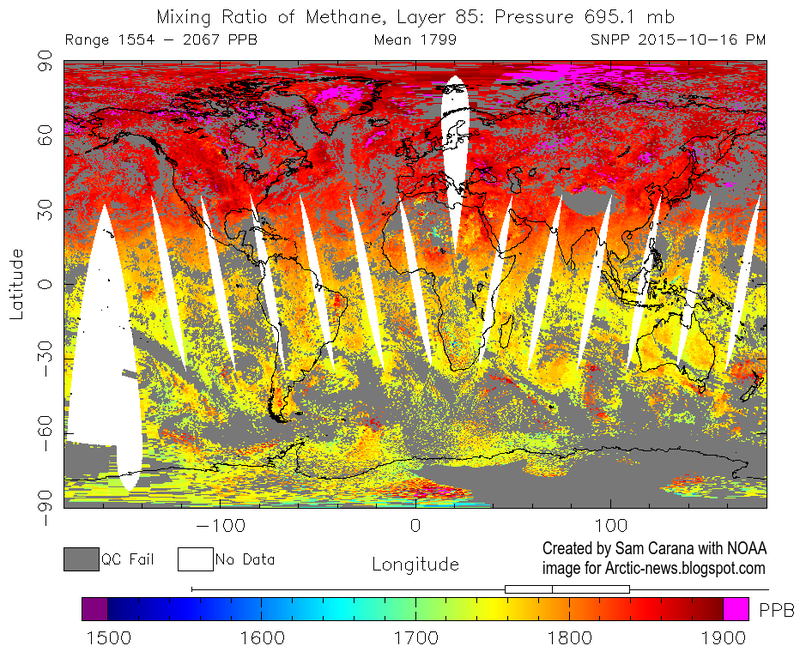 Above image shows methane levels at low altitude on October 22, 2015. Because of its height, there are no data at this altitude for Greenland. The image below shows methane concentrations at a higher altitude, with high methane levels showing up over Greenland on October 16, 2015. The following comments refer to Figure 224 below. All historical floating ice appears to have been lost in the Arctic by September 2015 so we can assume that the 5+ year old ice pack has largely gone by this time. The 5+ year old ice pack was only predicted to melt back by 2021.7 consequently this year's volume of ice melting has occurred 6 years earlier than the previous prediction. 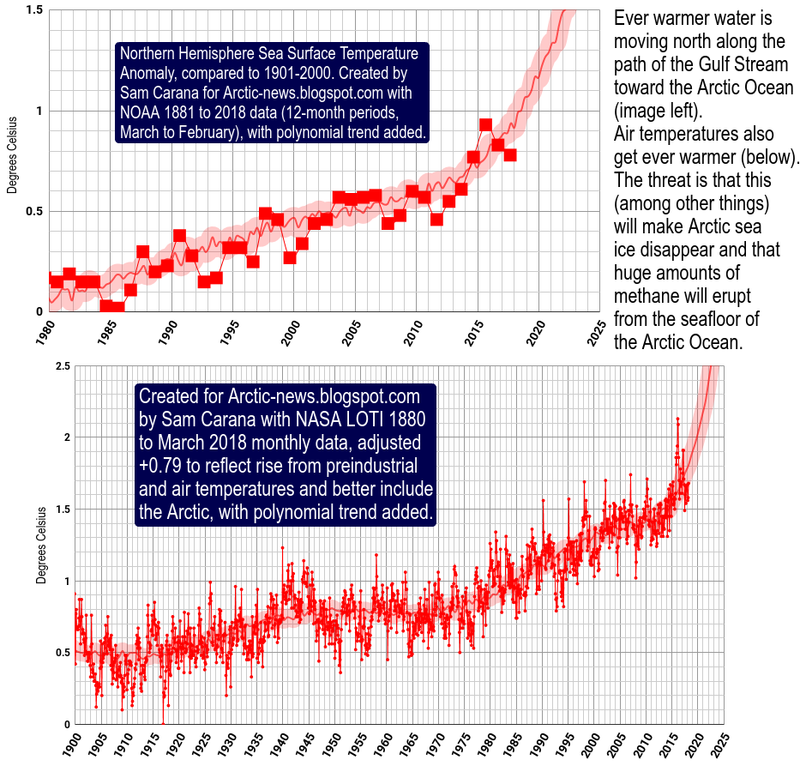 The previous estimate of the final loss of 1 year Arctic floating ice from polynomial data was 2037.7 which now corrects to 2031.7, 16 years in the future. 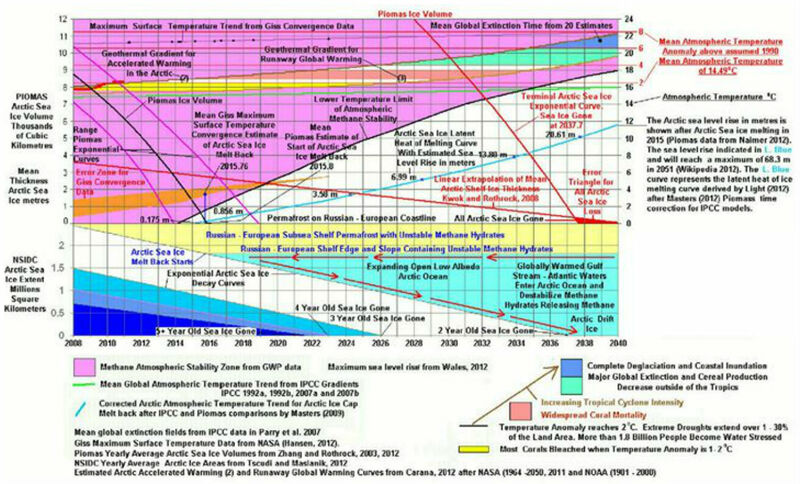 Previous estimates of when the average atmospheric global temperature anomaly increase would reach 6°C was 2034.7, by which time massive global extinction would be proceeding. The new corrected time for this event is 2034.7 - 6 = 2028.7 which is 13 years in the future. During the major Permian Extinction event, which was caused by a massive methane build-up in the atmosphere, the mean surface atmospheric temperature increased by 5°C over 13 years. As the present mean global surface atmospheric temperature is already greater than 1°C hotter than the mean, we will be looking at at least a 6°C temperature increase by 2028 with its associated global extinction event. This is a frightening correlation between the new predicted 6°C average global surface atmospheric temperature rise and what is known to have occurred during the major Permian extinction event, both of which were caused by a massive buildup of methane in the atmosphere. 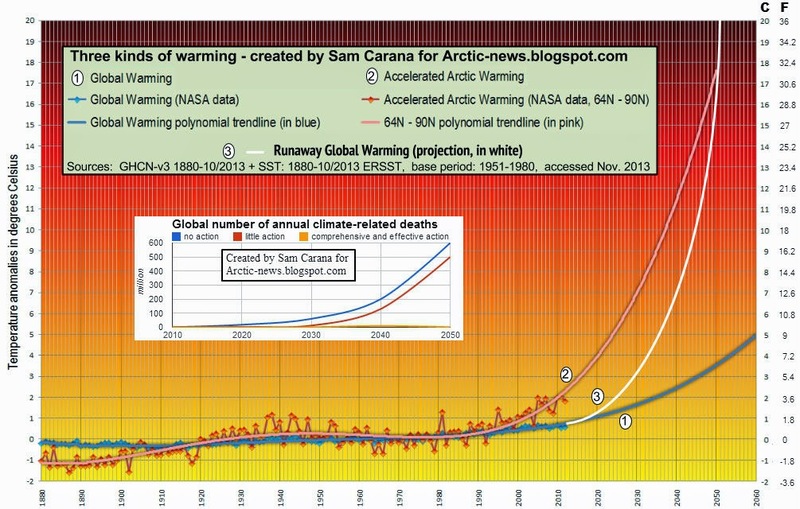 We are clearly in for a very rough-hot ride in the next decade as the terminal global extinction event approaches. Figure 224. Arctic sea ice melt back times estimated from area, volume and thickness anomalies compared to various extinction zones defined by the global atmosphere temperature field. Credit: Malcolm Light. Click on image to enlarge. I've been following you since the methane was spiking to 1800 ppb in the Arctic. Now the methane veil over all North America shows 1800 ppb. wow. I gotta get a car. Living the lifestyle wasn't enough! Methane Vent Hole In Arctic Sea Ice?